This is the photo I took for the Stuck in Plastic challenge on nostalgia. It’s not very challenging for me to take a photo I feel nostalgic about: most LEGO sets or minifigs from the 90s’ fill me with sweet memories from my childhood. So to make it more challenging I forbid myself from using a “vintage” LEGO set or minifig. 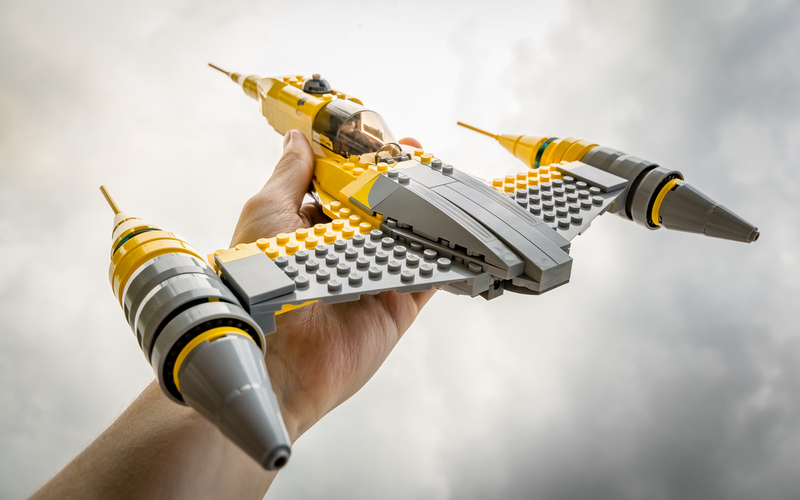 I quickly found the perfect shot for the challenge while building the latest LEGO version of the Naboo starfighter but probably have to explain why. I prefer the original Star Wars trilogy to the prequel. I think it’s obvious looking at my photo stream: in two years, I’ve never posted a single photo including an element from the prequel. Still, I don’t dislike the prequel and more particularly Episode 1. While I acknowledge some flaws in the movie, there are a few things I really like about it: the new music pieces from John Williams, Qui-Gon Jinn, the podrace scene, the Naboo landscapes, how impressive Coruscant looked like… and the Naboo N-1 starfighter. When Episode 1 was released, I was in the middle of the LEGO golden age of my childhood. One of the very first (if not the first) LEGO Star Wars set I acquired was the Naboo starfighter and it became my favorite LEGO spaceship. Since last year I hesitated on buying the new version LEGO released as I was feeling very nostalgic towards the 1999 version. A few weeks ago I finally acquired the new version and while building it, I fell in love with it. Even though there are a few things I prefer on the 1999 version, such as the way the cockpit opens, the way R2 sits and the absence of stickers, it is definitely an incredible experience holding the new model in hand. Indeed I haven’t felt so much the need to hold a spaceship in my hand and swoosh it around, like I used to do as a child, since I built the Imperial Star Destroyer last year. It unexpectedly became one of my favorite modern Star Wars set simply because it fills me with so much fun memories.